New Zealanders must now by apply for a Resident Return Visa (RRV) online by creating an ImmiAccount. Paper-based RRV applications will incur an $80 non-internet fee. Your initial RRV has a 12 month travel facility. Re-entering Australia beyond the Must Not Arrive After date on your Visa Grant Notice will see you granted a Special Category Visa. Oz Kiwi recommends anyone applying for RRV complete Form 80 – Personal Details and Character Assessment. The following information is intended for New Zealand citizens applying for a Resident Return Visa (RRV). After being granted RRV, you can sponsor your partner and children for a permanent visa. Children aged 18-25 must be financially dependent on the sponsoring parent and studying full time. Also consider whether RRV or the NZ 189 Visa is best for your family. New Zealanders entering Australia are a granted a Special Category Visa (SCV). The SCV is a temporary visa under the Migration Act. Some New Zealanders may be directly eligible for Australian citizenship. Prior to 1 September 1994 New Zealanders were automatically granted permanent residency upon entering Australia. A Resident Return Visa (RRV) enables them to reinstate that former permanent residency. Twelve months after being granted RRV they can apply for citizenship, provided they have resided in Australia for at least four years immediately prior to applying. Once granted RRV you cannot renew a Family Relationship 461 visa because you are no longer an SCV-holder. When a family member’s current 461 visa expires you will have to sponsor them for a Partner visa (from $7,160) or Child visa (from $1,755). in transit for just a few hours, provided they cleared Customs. For more information read Eligibility for a Resident Return Visa. cannot include their partner or children on their RRV application, if eligible they can make their own RRV application. When applying for RRV you must know the exact date you first entered Australia. All your previous travel is linked to your current passport. Even if you did not require a passport, there should still be a record of your visit because Incoming Passenger Cards have always been required. It is recommended that all RRV applicants request their travel records. New Zealanders can now apply for RRV online by creating an ImmiAccount. Paper-based RRV applications will incur an $80 non-internet fee. Applying for RRV can be confusing. Refer to completing your RRV application for some guidance. You will need to provide a written statement of your substantial ties to Australia now, and compelling reasons for any continuous absence from Australia greater than five years. For a longer absence you will need to provide more than one reason, or an ongoing reason. Include as many details as possible in your written statement. All criminal convictions, including historical, “spent” or minor sentences, must be declared on your RRV application. Failure to do so will see your application declined. You will also fail the character requirements if you have been sentenced to 12 months or more in prison, including historical offending or multiple short sentences totalling more than 12 months. A suspended sentence, where no jail time was served, is still a prison sentence. Request your New Zealand criminal conviction history, especially if you have resided in New Zealand for 12 months or more within the last 10 years, over the age of 16. Tick the box at step 3 of the form – ‘Full record of convictions’ to request your full record. There is no fee, it remains valid for six months, and takes 1-3 months to be processed. If you have completed military service provide a copy of your discharge papers. The Resident Return Visa online application fee is $375. If you choose to submit a paper application form you will also be charged an $80 non-internet application fee. Payment must be made electronically through the My Payments section of your ImmiAccount. Lodge your application within 30 days of making your online payment. After submitting your RRV application and payment online you will receive a confirmation email/letter with a Transaction Reference Number (TRN). You can then upload scans or photos of your supporting documents and certified passport photo page. Do not send Home Affairs any original documents. Scans and photos must be in colour, one document per file. Ensure they are clear. If a document is more than one page, save it all as one file. Give files a descriptive name, for example, John Smith birth certificate. RRV application processing times have varied significantly in recent months. It can take anything from 2 to 67 days to be granted your initial RRV. Remember, the Special Category Visa is a temporary visa. If the Department of Home Affairs require any additional information, or supporting documents, you will be given 28 days to provide them. Keep them informed if there will be delay in obtaining documentation. You should be emailed a confirmation letter and a Visa Grant Notice. Being granted a Resident Return Visa makes you a Permanent Resident, and allows you to reside in Australia indefinitely. Note: your Resident Return Visa has a 12 month travel capacity. Because New Zealanders haven’t resided in Australia as a Permanent Resident for at least two of the last five years, they are initially granted a 12 month travel capacity. Keep a copy of your Visa Grant Notice with your passport and confirm your PR status at the airport Immigration desk. It will be located just past the Customs counters and SmartGate scanners. You can be outside of Australia for up to 90 days of the 12 months, with some work-related exceptions. You must renew your RRV if you are travelling overseas after the initial 12 months. Check your visa status using Immigration’s VEVO system. Email the RRV processing team, phone the Department of Home Affairs on 13 18 81 or contact them via social media. Please do not provide your personal details on a public forum. 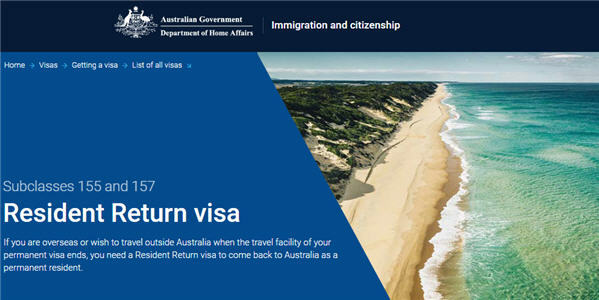 The above “Applying for a Resident Return visa” information should not be relied on as an alternative to advice from the Department of Home Affairs, or a professional immigration services provider.